Jeffrey Katzenberg, a liberal donor who was awarded the prestigious National Medal of Arts by President Barack Obama last year, will be laying off 350 of his employees at DreamWorks Animation, according to a CNN report. The beleaguered movie studio DreamWorks Animation is embarking on a round of sizable layoffs, potentially involving more than 15% of its employee base. A person with knowledge of the plan confirmed a Los Angeles Times report that the cuts "are expected to include animators, story-board artists and other production personnel and support staff." DreamWorks employs about 2,200 people—the Times said more than 350 are likely to be laid off. The decision comes after a disastrous year for Katzenberg. Multiple attempts to sell off the studio, first to Japan's Softbank, later to toy company Hasbro, fell through due to Katzenberg's insistence that the studio is worth far more than it actually is. Softbank offered $3.4 billion for the studio, which is more than DreamWorks shares are worth. Katzenberg then went across the aisle in an attempt to sell the studio to Rupert Murdoch for nearly $4 billion, but was rejected. Things have gotten worse for the studio since those failed sales. Penguins of Madagascar was a box office flop, and the DreamWorks share price fell even further. An industry analyst told CNN that DreamWorks is unable to sell and must cut costs. "Unfortunately, everyone in the industry sees the predicament DreamWorks is in, making it impossible to sell the company anywhere near current levels," an analyst from BTIG Research told CNN. "Cutting costs is the only near-term option." Despite the bad year for DreamWorks, Katzenberg was honored in July 2014 with the National Medal of Arts, which is the highest honor bestowed on members of the arts community in the United States. 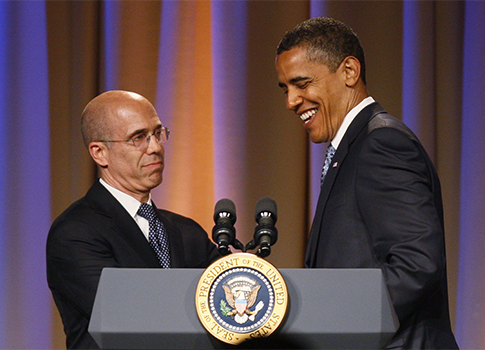 Obama also visited the studio in 2013 to deliver a speech on job creation in which he praised Katzenberg for his work at DreamWorks. "Hundreds of thousands of middle-class jobs—they’re not always on the marquee—jobs for electricians, and carpenters, and sound mixers, and makeup artists, and designers, and animators depend on this incredible industry here in southern California," the president said.